Launched in 2014, Option888 is a comparatively new addition to the binary option world online. Its available in several different languages, including English, French, German, Italian, Swedish, Danish, Norwegian, and Finnish. Also, several different currencies are available for account keeping. The ability to keep your account in Swedish, Danish or Norwegian currency instead of major currencies such as EUR or USD has made Option888 especially popular in the Nordic countries. Option888 distinguishes itself by offering two cryptocurrencies as underlyings for binary options. This is unusual and makes it possible for traders to gain exposure to cryptocurrencies without actually having to own any cryptocurrency. A negative aspect of Option888 is that a €500 (or equivalent) first deposit is required to get the 100% first deposit bonus. Option888 is owned by Altair Entertainment N.V, a company based in Curaçao in the Caribbean and licensed by Curaçao. The head office is on Malta in the Mediterranean. Your first deposit to Option888 must be at least €500 for you to get a welcome bonus. The welcome bonus is 100% of the deposit, up to a maximum of €888. You can’t do real-money trades in a demo account, only play-money trades. The demo account is a great way to learn the platform and try out trading strategies before you proceed to a standard account. The standard account is for real-money trades at Option888. You must do a first deposit before you can start using your standard account. Option 888 use a trading platform from highly regarded Tradologic. The platform is browser-based; no downloadable platform is available. The platform is very sleek and minimalistic – almost overly so since there is no ticker showing news, trends, signals, etc. Finding ones way is very easy since there are no frills to distract. You start by selecting underlying and binary option type. You will now see all available binary options that fit both criteria. A graph will be displayed on screen where you tailor and fine-tune your binary option to suit your preferences. When you’re ready, finishing the trade is quick and simple. Option 888 offers mobile trading apps for iOS and Android. The Android app is found in Google Play and the iOS app is in Apple’s App Store. The app works well on both phones and tablets. Examples of binary option types available at Option 888 are Over/Under, Range and One Touch. The binary options with the shortest lifespan at Option 888 are called Turbo. Turbo binary options are available with a lifespan of 30 seconds, 45 seconds, 1 minute, 2 minutes, or 5 minutes. You can close an open position before the binary option has expired by selecting Close. You can extend the lifespan of a binary option that you already own by selecting Extend. 888 Option has a large selection of shares, currency pairs, commodities and indices as underlyings. This broker is a great choice for traders that want to have a lot of underlyings to chose from. The share selection isn’t just large (160+ share companies) it is also geographically diverse, including shares traded on exchanges around the globe. You can for instance pick Severstal, Lufthansa, Ferrari, First International Bank of Israel, Abu Dhabi General, Tata Consultancy, Taiwan Mobile, Luzhou Lao Jiao, Facebook, or Tesla Motors as underlying. The large selection of indices is also geographically diverse, and contains indices such as EGX Cairo, South Africa 40, Nikkei 225, Dow Jones, Bovespa Future, Dubai General, FTSE 100, and Tel Aviv 25. The assortment of available commodities contains both metals, e.g. gold, silver, led, nickel, platinum and palladium, and agricultural produce such as coffee, maize, soy beans, wheat and sugar. 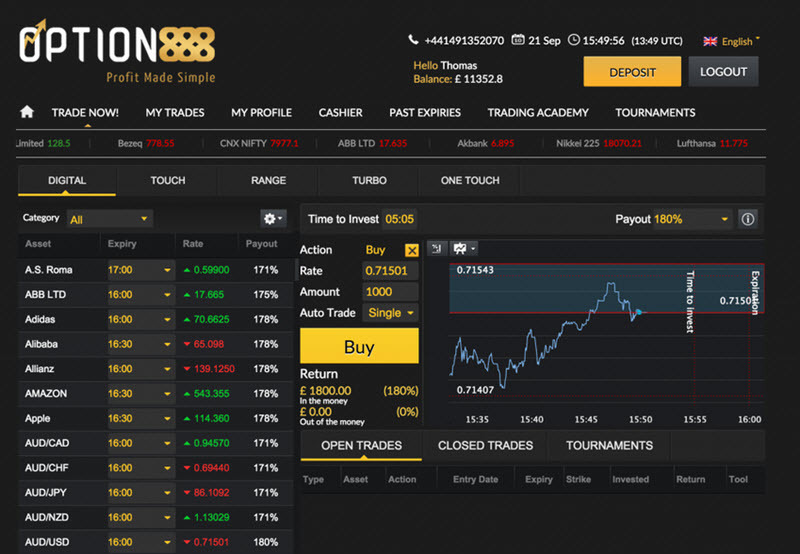 888 Option’s selection of currency pairs isn’t just big – it also contains two crypto-currencies. This means that you can gain exposure to Bitcoin and Litecoin without actually having to own any crypto-currency. Please note: MXC stands for Multi Commodity Exchange of India Ltd, a commodity exchange based in Mumbai. Withdrawals: Option888 are famous for their unusually quick processing of withdrawal requests.